Towering basalt, sheaths of shooting stars (of the floral kind) and surging waterfalls set the scene. Like a diamond touched by rain. That’s how Barbara Robinson describes the sweeping panorama, laced by mist, of an undulating meadow, dotted with wildflowers, overlooking the majestic Columbia River. Although an occasional downpour showers the scene, the mood clearly isn’t dampened. This is the Columbia River Gorge after all, and there’s never a spring day without beautiful vistas — towering basalt columns, sheaths of shooting stars (of the floral kind) and surging waterfalls. 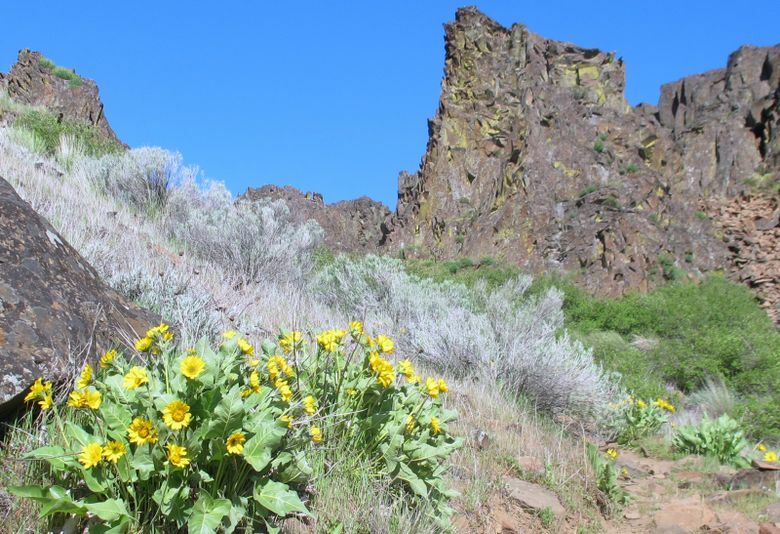 Robinson is co-leading a hike of about 25 people from Oregon and Washington seeking to learn more about wildflowers while taking in the magnificent views on two pristine trails. Robinson is a retired Portland Community College biology instructor and native plant expert. The hike was organized by two nonprofits, the Friends of the Columbia Gorge, a conservation group headquartered in Portland, and the Klickitat Trail Conservancy, a group based in Lyle, Klickitat County, that helps manage an old railroad corridor-turned-scenic trail along the Klickitat River. 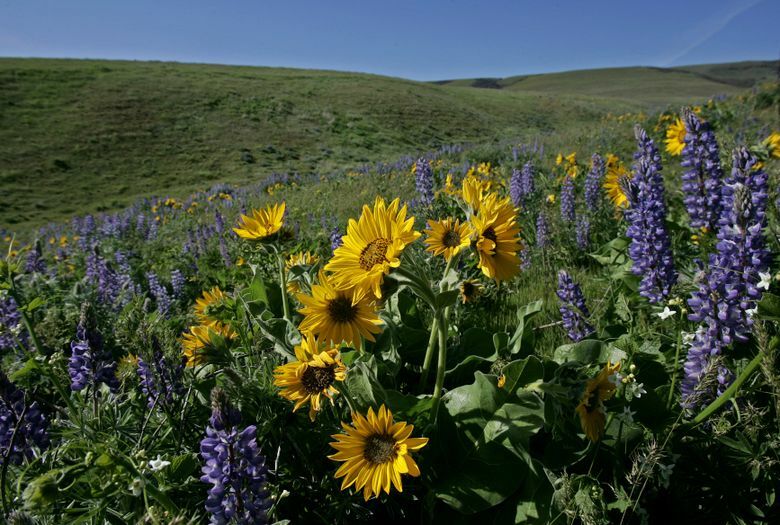 Steven Woolpert, vice president of the conservancy, will help lead the second phase of the hike along the southern end of the Klickitat Trail, considered a wildflower jewel in the gem-dotted Columbia Gorge. It’s the time of year when the Gorge puts on its breathtaking display in rainbows of color. Wildflowers spring to life in fancy clothes: showy golden balsamroot, cobalt and lemon-tinged camas, pearly whitlow grass. A natural and picturesque area, the Gorge encompasses impressive tableaus: etched basalt tiers, more than 70 waterfalls, as well as 800 species of wildflowers. In 1986, President Ronald Reagan signed the Columbia River Gorge National Scenic Area Act into law, bringing under federal protection large segments of an 83-mile stretch, roughly between Washougal on the west and Wishram on the east in Washington and from the Sandy to the Deschutes rivers in Oregon (see fs.usda.gov/crgnsa). The day begins at Catherine Creek, about a 40-mile drive west of Goldendale, just off State Route 14 on County Road 1230. The paved trail is a 1.5-mile loop, offering wheelchair access along with grand views of the river below and craggy rocks above, on the site of a former homestead. Once heavily grazed by cattle, most of the native grasses are gone as well as a few native flowers, but the flora still existing put on a gallant show. Geological forces created an unusual habitat here, Robinson explains, allowing delicate, shallow-root flowers to blossom. They may not leap out like bicolored lupine, the lavender and white beauty that awaits on the Klickitat Trail, but delight nonetheless. The Missoula Floods some 14,000 years ago thrust the level of the Columbia River up 900 feet above its current height, stripping the hilly site and leaving shallow soil. Thus, tinier flowers (sunny Western buttercup, pearly Western saxifrage, pretty-in-pink prairie stars) are the rule here, and they try harder. After Robinson mentions she’s hoping to spot poet’s shooting stars, the plum-colored darts appear on cue around a bend. Nearby lies a more subdued counterpoint, the snowflakelike shepherd’s cress. “I’m glad I’m on this tour because that would have been a clover to me,” says Carol Whitney, from Brush Prairie, looking at the cress. She and her husband, Jack, were pleased to have even the smallest flowers pointed out and named. “Otherwise, I could walk by and not see anything,” Carol Whitney says. A prevailing sentiment among the hikers is to learn to identify flowers they commonly see. Amid the golden yarrow, glittery desert parsley and sapphire cluster lilies are oddly, yet aptly, named stork’s-bill, grass widows and naked broomrape. Even the native dandelion has a back story, albeit a bit obtuse; Robinson explains it’s from the French, dent-de-lion, meaning tooth of the lion. Then there are the stay-aways: poison oak and inedible death camas (“They say it’s a way of getting rid of an unwanted husband,” Robinson notes). While the Catherine Creek Trail meanders along grassy meadows through Ponderosa pine and Garry oak stands, the Klickitat River Trail flanks the eponymous river canyon for 16 of its 31 miles. Beginning in Lyle, about a 35-mile drive west from Goldendale, the Klickitat Trail follows the railroad corridor that was abandoned in 1992. Volunteers in 2003 formed the Klickitat Trail Conservancy, overseeing a trail managed by Washington state, the U.S. Forest Service and the 150 conservancy members. Hiker Marion Fox joined the conservancy because she “fell in love with the Gorge” after moving to White Salmon 10 years ago from Tennessee. Among other treasures, in the spring this trail offers carpets of striking bicolored lupine, bigleaf maples (with bright chartreuse dangles), teal Idaho fescue and fragrant mock orange. Lest anyone think it’s just a flower day, hikers are greeted with a bald eagle, scolding Steller’s jay, northern shovelers, trilling meadowlarks and a great blue heron. It’s also a day where continued preservation of the Gorge is on hikers’ minds. The original protection came after Friends of the Gorge was founded in 1980 by Nancy Russell, a Portland volunteer determined to keep Gorge lands from being carved in a scattered fashion by unfettered development. A mix of federal, private, state, county, city and tribal lands line the 300,000 acres on both sides of the Columbia. Once the land came under federal protection, the Friends group, which numbers 5,400 members, transitioned into ensuring the recreational, cultural, scenic and natural attributes are preserved. The group also leads more than 100 hikes in the Gorge every year. Woolpert, of the Klickitat Trail Conservancy, worries about coal and oil trains coming more frequently through the area. There are proposals to build two coal terminals, along with 11 oil terminals and refineries either contemplated or under construction, in the Pacific Northwest. That would greatly increase rail traffic through the Columbia River Gorge, Woolpert says, which he believes enhances the chance for derailments.